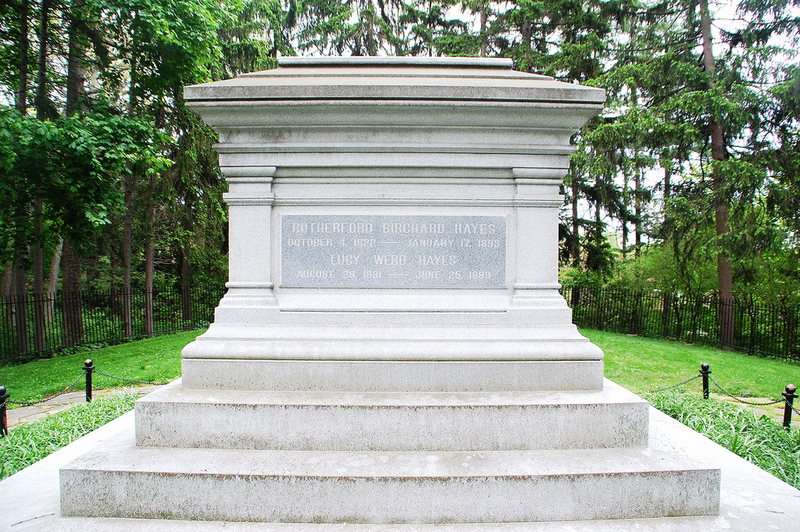 See him: Ohio presidents have big tombs. There’s William McKinley’s gigantic memorial in Canton, Warren Harding’s open-air, classical-style tomb in Marion, a towering obelisk for William Henry Harrison, and James A. Garfield’s Victorian death castle. And then there’s Hayes – his grave marker is taller than I am, so it’s only undersized compared to the competition. But maybe Hayes didn’t need a big tomb, given that his grave is behind his enormous house, Spiegel Grove. By the time he finished renovating the place, it had eighteen bedrooms and more than 20,000 square feet – not counting the carriage house or the enormous presidential library next door. His tomb isn’t the biggest in the state, but there’s something big to see in Fremont nonetheless.